The application has been filled out and it sits on my desk for close to a year. It is repeatedly buried by bills and then excavated as I pay the bills and file them away. It surfaces. I ignore it. Sometimes it feels like we might be biting off more than we can chew. Just, ask anyone and they’ll agree that Aaron and I already have our hands full. Lucy has been struggling; it’s been two years of really unpleasant behavior. There is crying in school, outbursts at home, scratching, biting, swearing and resisting transitions. 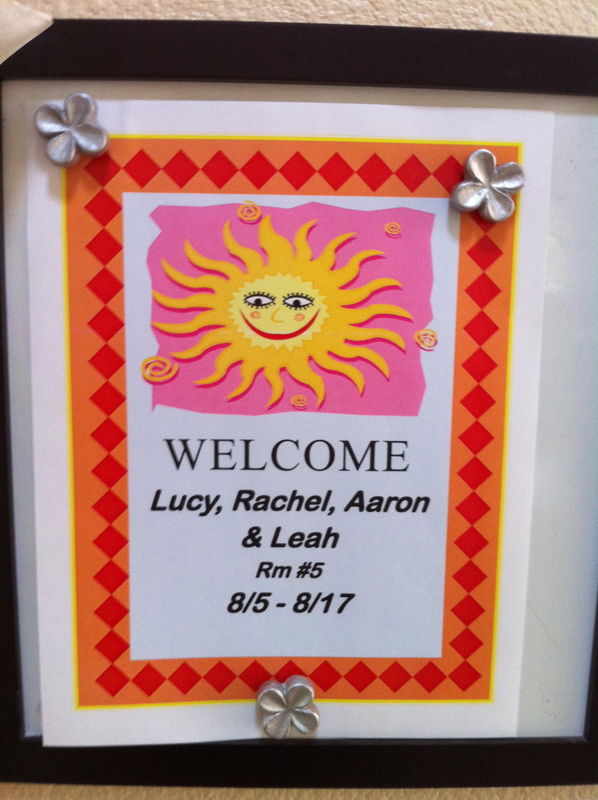 We’ve come to suspect that Lucy’s cerebral palsy may be the real culprit. As we meet parents of kids that have CP they share many similar stories, debilitating anxiety, uncontrollable outbursts. So, the application sits on my desk another day, another week, and another month. I do a presentation in Sacramento, California. Nancy coordinates the event and takes us to lunch afterwards. 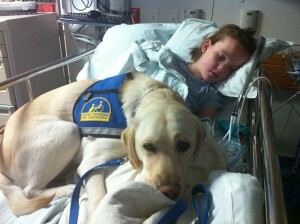 Nancy’s service dog, Whisper, is by her side during the event and at lunch. Being in a wheelchair, if a dog jumps up on her, licks her, sniffs her, or puts their open mouth near her… she is helpless. She can’t just turn around and walk away. She can’t push a dog off. When dogs bark she flinches, she jumps. I’m not a dog person, never have been. I secretly believe most dogs want to bite me. But… Whisper… Whisper is just that, quiet and almost invisible! Whisper doesn’t sniff, bark, or jump. At the restaurant Whisper doesn’t give Nancy the “you’re eating and I’m not” stare. Whisper is quiet under the table and doesn’t even seem interested in dropped food. Whisper doesn’t take a potty break unless given a command. Whisper knows more than 40 commands. Now, I’m fascinated. This seems like the perfect dog! Nancy agrees that Whisper is the perfect dog for her. They had been pre-matched through Canine Companions for Independence. 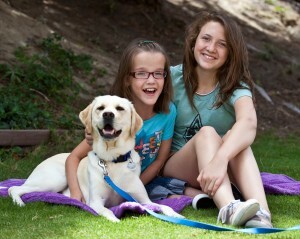 I catch a glimpse, a little slice, of what having a service dog in our family might actually be like. I’m intrigued by Whisper… I actually like Whisper! After lunch, we walk back to our car. Before leaving, I hug Nancy and say, “Thank you so much! I’m mailing in our application as soon as I get home.” Nancy encourages us to do it and she promises that we won’t regret it. I do my best to believe her. 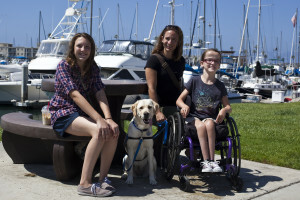 Within a few weeks of popping that application in the mail, we get a phone call from Canine Companions for Independence in Oceanside, California. They’ve reviewed our application. We’ve passed the first step of the process and they are calling to set up a phone interview! On our phone interview we’re nervous and not quite sure how a service dog can help Lucy. We find out that since Lucy is not 18, she won’t hold the leash. This means that a service dog doesn’t free up our hands, it ties up one hand! 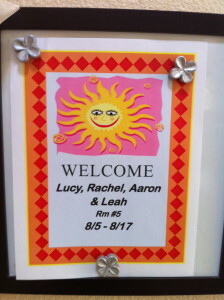 I try to fathom pushing Lucy’s wheelchair, managing a dog AND signing to Leah. Hmmm. 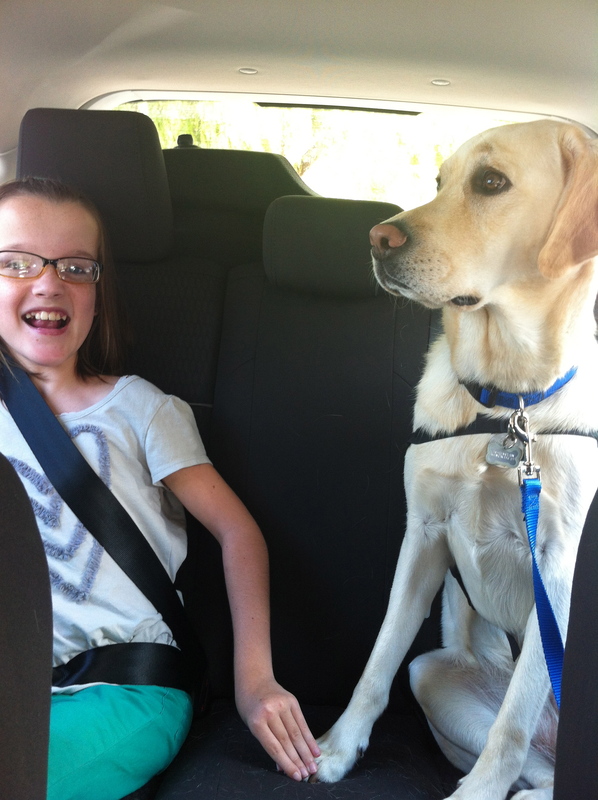 We find out that the dog can’t go to school with Lucy and some of her hardest times are at school. Hmmm. The Skilled Companion team is made up of three- the dog, the recipient (Lucy) and the facilitator (myself or Aaron) and that team can be certified to go in public, on airplanes, in restaurants… anywhere really, as long as it is a team of three. I’m still not sure what a service dog will DO for Lucy. If we are right there… and we always are, we can pick up dropped items, and we can open doors. Are we really going to ask a dog to do that? Seems superfluous. In the interview we mention Lucy’s difficulty with transitions and how even though we fought for her to attend public school, with socialization in mind, her behavior was isolating her socially. Our interview ends. Aaron and I look at each other confused. Was that good? Was that bad? A few weeks go by and we receive another call from Oceanside, California. Every time they call, I get emotional, confronted, excited, nervous, hopeful, my eyes fill with tears. I see the number on my phone and scream, “AAAAAHHHH!!! YOU GUYS, IT’S CCI!!! !” Everyone gathers around to see what it is they have to say. This time they say that we are invited to come for a face-to-face interview in December! We will work with dogs, learn about the next steps in the process, and share what we hope our family can gain from this new Companion. I book the flights, car and hotel room. 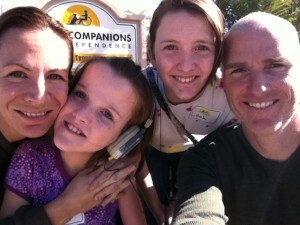 Our interview falls on the weekend of Leah’s 15th birthday. 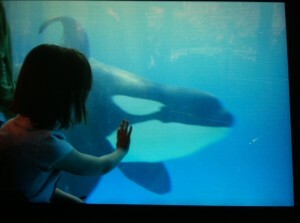 We make a vacation of it- and decide to squeeze in a trip to Sea World, perfect! It’s December, we pull up to the CCI campus and my eyes fill with tears. Geez! Why am I so emotional? We unload and check in, meet the group of other hopefuls and get a tour of the campus. We spend part of the day in lectures. We learn the command sequence that facilitators use with the dogs and we practice the sequence and corrections on “carpet dog” not a real dog. Then, they bring in real dogs. Aaron volunteers to go first. He loves Labradors. Since he goes first, I have to go second. I’m nervous, and I give the dog a correction before the dog has a chance to execute my command. I take a breath and remind myself to have realistic expectations. I get another chance and do better. I just don’t want to blow this for Lucy, if it really is an option to get a dog placed with us, with her. I praise the dog and it’s real praise, I’m SO happy that the dog actually sits when I ask it to sit. It seems a tall request but I have to make it, “No barking?” We are told that is an easy request, none of the dogs bark, not even when the doorbell rings. They only bark on command. I’m baffled. We request no excessive licking, sniffing or jumping up. This turns out to be an easy request; none of the dogs do that. “No jumping on furniture” Done! The dogs will not get up on anything without a command telling them to do it. I imagine the future episodes of doggy-doo tracked in the house. No, the dog won’t go to the bathroom unless you give the command, they are always on leash, so you just pick it up immediately. Really? No “landmines” tracked in from the yard? We are now clear what the dog won’t do. But what will this dream dog do for our family? Maybe, it will be that missing piece that eases transitions? Perhaps it will become a built-in best friend? Will Lucy’s focus be on the dog rather than on her fears when we are out and about? 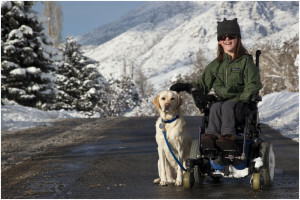 Will people talk to Lucy about her dog, “Is that your dog?” rather than talk to me about Lucy, “Why is she in a wheelchair?” Any one of those might make a difference. And that is it. We pack up. Say our goodbyes and watch Shamu splash around. If we pass this step we will eventually be invited to Team Training; a two-week course where we live on campus and are trained to work with the dogs. We are told that we will not be called unless there are two potential dogs pre-matched with us, that’s why the wait can be a year or more. Sometimes I fear what my calendar has to say. The calendar shows the first week of the two is scheduled for Camp Attitude– a week long camp created for children with disabilities, in Foster, Oregon… and the second week ends with my Signing Time concert in Boston. We sit down and discuss both options and decide we should take a vote. “All in favor of going to Camp Attitude in Oregon? We pack and drive to Oceanside, CA the first week of August. 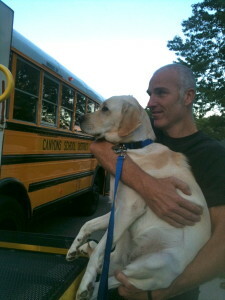 As we pull into the parking lot of the CCI Campus, I’m overcome with emotion again! Seriously? We park, and Lucy informs us that she is NOT coming in. “Ok,” Aaron says, “whenever you are ready.” We’re pretty sure that at some point in the next two weeks she will choose to get out of the car. We unpack and go to our dorm room. It’s bigger than we imagined. We have a private bathroom, a bed, a hospital bed and a blow-up mattress and there’s still plenty of room for Lucy to maneuver her wheelchair. Sure enough, in a matter of minutes Lucy rolls in and our girls take off to explore. Leah discovers a library of movies on VHS. The girls are excited to watch them all. There’s Apollo 13, Big, Forrest Gump, Castaway, and more. They start an unofficial Tom Hanks movie marathon. 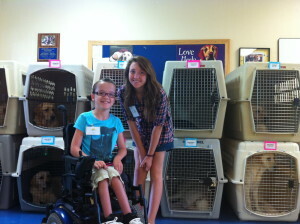 Lucy and Leah come back and excitedly tell us that in the training room there are 12 dog crates with pink or blue nametags. We sneak in and read the names: Topper, Huntley, Waddie, Malvern, Wilona, Talia, Kong, Janessa, Leann, Donahue, Leon… hmmm, we discuss which names we would prefer NOT to have to call out for the next 8-plus years of our lives. (Malvern and Wilona top the list) We’ll start our training in the morning. It’s 9am-4pm daily. We’ll have Sunday off. The following day we have lectures. We practice the command sequences. We practice with carpet dog. We learn so much about dog behavior and human behavior. Breakfast and lunch are provided almost every day. Volunteers come in and feed the eight hopeful recipients and their families, and the whole staff. After lunch the real dogs are brought in. CUTE! CUTE! CUTE! Really? We are pre-matched with one of these awesome dogs? We look them up and down. We are told to try not to get attached and to try not to get our hearts set on a certain dog. 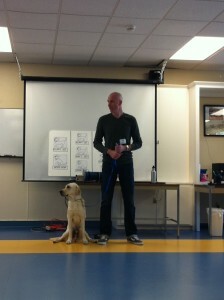 The instructors bring the dogs around and we meet them. We are excited and nervous. Now, we work with the dogs. Leah keeps a secret tally, tracking the dogs that Aaron and I work with. We try to sort out which ones we might be pre-matched with. The next day we work with more dogs, Leah keeps track. There’s one dog that I fall in love with, but I do my best not to get attached. She’s cute. She’s so white! According to Leah’s tallies we’ve worked with her most. It’s Wilona. Yes, one of the names we had originally said, would not work for us, and now it didn’t matter. She was Wilona, Willow, Willy, Wilsy and Wil. We pretend not to be super excited every time we work with her. Leah and Lucy do their best to suppress grins and giggles of joy. We try not to look disappointed when we work with another dog. The third day of Team Training is when we are officially pre-matched with a dog. Everyone arrives to class on time. We anxiously await the announcements. They start with Lucy. “Lucy Coleman, you are pre-matched with…. WILONA!” They bring Wilona over to us and hand us the leash. I’m crying and smiling. Aaron has tears in his eyes and he roughs up Wilona’s fur. Lucy grins and buries her face in Willow’s neck. Willow licks Lucy twice and sits down by our feet. Leah has happy tears streaming down her face and signs, “I can NOT believe this is happening!” True. It is unreal. We learn so much. Day after day we work with Wilona. She stays in our room. The first few days I watch her with an eagle eye. Is she going to get into the garbage? Nope. Is she going to have an accident on the floor? Nope. Is she going to jump up on the beds? Nope. Not unless we say, “JUMP”. Day after day, night after night, she’s a perfect angel. At some point we realize that Lucy has only had one outburst in almost two weeks. We are living in a new place. We are surrounded by new people and eight dogs… and Lucy is doing great! We tell Willow to JUMP up on Lucy’s bed. Lucy falls asleep with one hand on her dog. Lucy falls fast asleep and doesn’t ask us to “snuggle”. 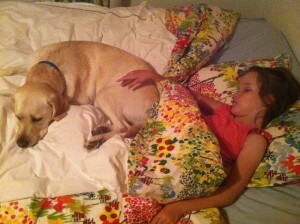 Our daughter hasn’t fallen asleep without her nightly snuggle for 12 years. To our amazement, Lucy sleeps through the night. Our daughter has not regularly slept through the night in her whole life! 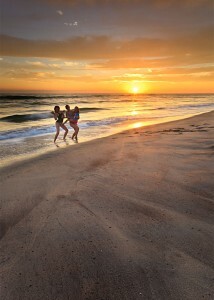 We are in class until 4pm daily, and then we head to the beach. 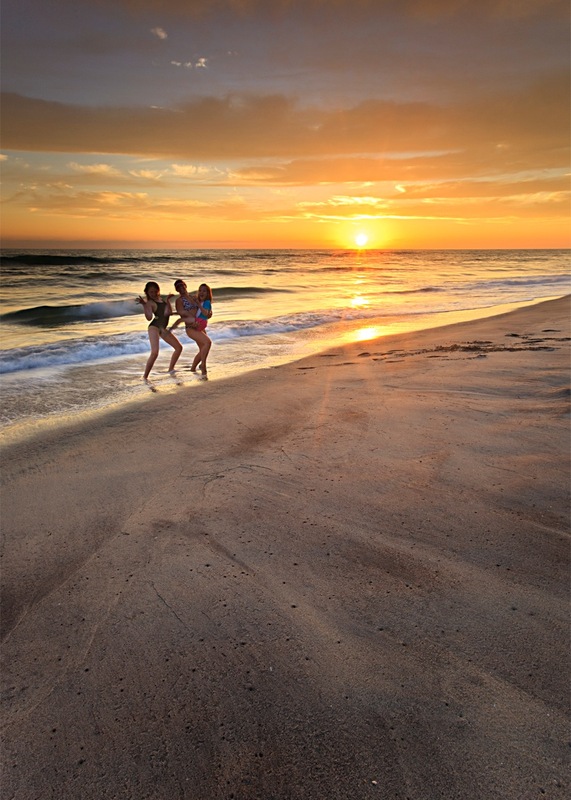 Aaron takes photos of sunsets… Leah, Lucy and I photo-bomb his really beautiful pictures. Time flies and we are coming up on our final tests and graduation day. Every day we have quizzes on what we’ve learned. We practice with the dogs in restaurants, at the harbor, the mall and K-mart. Aaron walks in our room one evening to find me snuggled up on Lucy’s bed with Willow. “Now, that is something I never thought I’d see in my entire life!” he says. “No, Leah, I am covered in LOVE!” …And I am, I’m covered in love. On graduation day we meet the amazing family that voluntarily raised Wilona for her first year-and-a-half. They gave her the groundwork, training and love to actually fulfill the job she was born to do. Only 20-30% of the dogs born and trained for this actually get placed as Service Dogs. We have brunch with her Puppy Raisers and they give us a book with photos of Willow’s first year and a half. When we come up on stage for graduation, they tearfully pass Wilona’s leash to Lucy. We tearfully accept. Wilona is officially Lucy Coleman’s Skilled Companion. 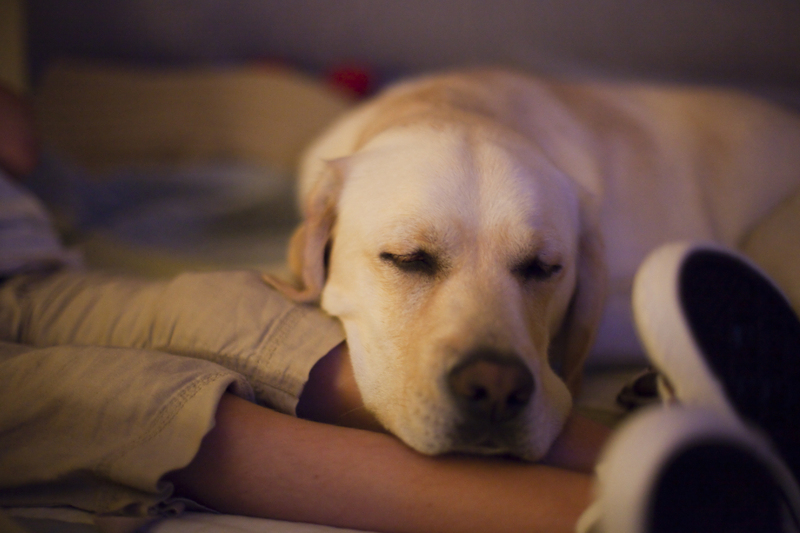 It’s amazing how much love, time, and dedication go into each one of the Canine Companion dogs. It’s amazing how much time, devotion and training goes into each family and recipient. Canine Companions is a not-for-profit organization, privately funded by donations. We paid for the gasoline to drive from Utah to California. We bought a few dinners. We bought a crate. Everything else, was given to us, everything else; leashes, collars, food bowls, a huge bag of dog food, toys, brushes, shampoo, toothbrush, poultry flavored toothpaste, a place to stay, meals and training… given to us. It almost seems too much. Wilona has now been with us for eight months. The difference in our entire family is ridiculous. I never could have imagined that a dog would give us so much. I think back to those early interviews, our concerns and the question of what a dog could provide for Lucy, for us. Now I know why no one could answer that… it’s because there are no words to describe it. They say a picture is worth a thousand words, so hopefully here’s a glimpse that communicates at least a tiny bit of the joy, peace, and love that our family found, in what seemed the most unlikely of places, our Canine Companion, Wilona Coleman. Every year I think about sending a Christmas card… but, I don’t do it. Yes, that is Leah. She’s a week old… well, not any more. She’s actually 13 and that photo just got me thinking that I should probably send out a card JUST so people know we don’t look like that AT ALL. I am terrible at sending out Christmas cards. The worst part is, I WANT to be good at it. Every year I buy cards. Sometimes they even have the sticky place to put a photo, because I fool myself into believing I might really pull that off too! My cousin Jen has it down. Hers is always the first card I receive each year. She must do them while we are all taking our turkey induced nap on Thanksgiving. Perhaps, I should pride mine in being the LAST card people receive… or as reality would have it, the last card they don’t receive. (sigh) I am not good at the Christmas card thing and I should accept it. Please don’t suggest I email a card, because really… emailed Christmas cards don’t even count! That’s all I am going to say about that. This year, I sat down with Aaron and mused at the possibility of writing one of those AWESOME Family Christmas Letters. Now there’s a commitment!! I secretly believe some marriages end over those annual productions. I opened the 2009 calendar to see if I could remember what we actually did this year. GAH! First of all, my calendar is 4 feet wide and 3 feet high. The boxes are crammed full of appointments, flight numbers, and the school holidays are highlighted, so we don’t forget and accidentally drop our children off. I could hardly decipher the information, let alone organize it and make it sound lovely. We’re still in Yellowstone, remember? When we arrived in Mammoth, we saw elk, everywhere. We hiked the terraces of Mammoth Hot Springs. The terraces look like ice and snow. Very Superman, don’t you think? We watched Old Faithful and other geysers erupt. Leah and Lucy became Junior Rangers, with Yellowstone patches and all. The trip was a complete success! We packed up on Saturday morning to head home… head home for surgery. Lucy would be admitted on Monday in preparation for surgery on Tuesday. We had it all planned out, remember? Maybe it was scheduled too tightly. Lucy had to start a clear liquid diet the day we drove home from Yellowstone. Not so yummy. Chicken broth, sprite, juices, Jell-o and that’s about it. She would have a second day of clear liquids and then she would go into the hospital. Well, that didn’t go so well. She got sick. Really sick. I would prefer any one of us get sick, anyone other than Lucy. This is not good. Lucy can’t roll over. She can’t sit up. 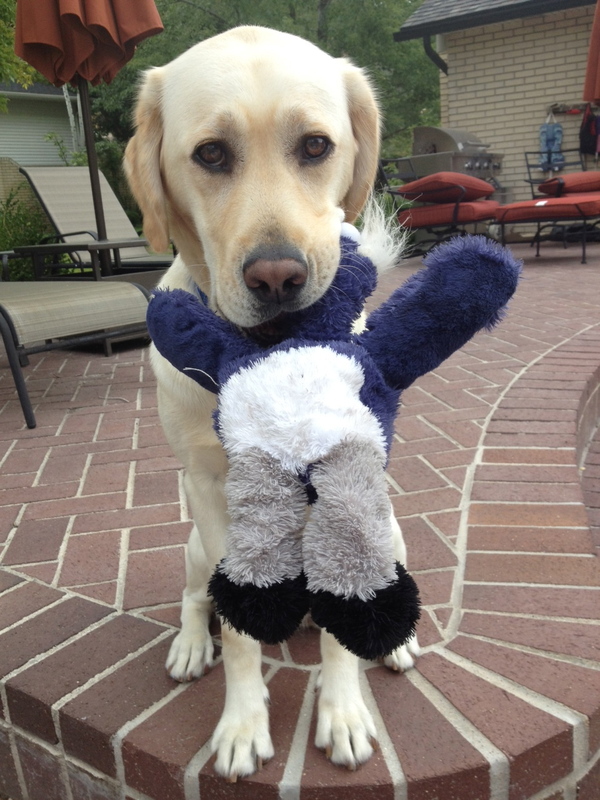 She could choke… aspirate… When Lucy is sick, we are all on high alert, until the threat has passed. I sprung from bed (truly I sprung, you should have seen it!) I hollered, “AARON!” as I ran. Then he sprung, because you spring when your wife screams your name as she tears down the hallway to your child’s room. Then we spent the following 24 hours either right by Lucy’s side, or not far from it. It wasn’t pretty. Trust me. (This is the part where you are SO glad that blogs are not scratch and sniff.) Lucy, with the flu is a 4 man job. Someone to hold the bowl. Someone to hold her up. Someone to hold her head up as her little body is wracked. She burst blood vessels in her eyes, from retching so violently. Monday morning I called the hospital to let them know she had been sick. They asked me to bring her in for an evaluation to determine whether or not surgery should be canceled. We packed like we were going in for surgery and a week of recovery. I told the doctor everything that had happened in the past 48 hours. Then he announced that it would be best to wait and reschedule the surgery. Lucy had just completed 48 hours of eating nothing but clear liquids and ralphing them up again… and we would have to do it all over again in a few weeks, hopefully without the ralphing. We hugged, and then, two very exhausted girls had a little cry. Then we got our things and went home. But wait, it can’t end there! That would never do! As soon as Lucy felt well enough to eat Chicken Sliders from The Cheesecake Factory, which was within a few short hours of canceling her surgery, I booked flights to San Diego! Early Wednesday morning Lucy, her cousin Clara, and I flew to California and went straight to Sea World for three days! Lucy and Clara giggled non-stop… for three days! On the flight home, Lucy smiled and said, “Hey mom! That was WAY better than surgery!” Once again, Lucy is right. We might just no-show and go to Sea World again!